On April 7, 1986, Connie Michaud began her career with the City of Caribou as the motor vehicle agent, later adding assistant clerk to her many duties. CARIBOU, Maine — On April 7, 1986, Connie Michaud began her career with the City of Caribou as the motor vehicle agent, later adding assistant clerk to her many duties. Today she looks forward to a happy and fulfilling retirement after serving the city for exactly 33 years and one day. 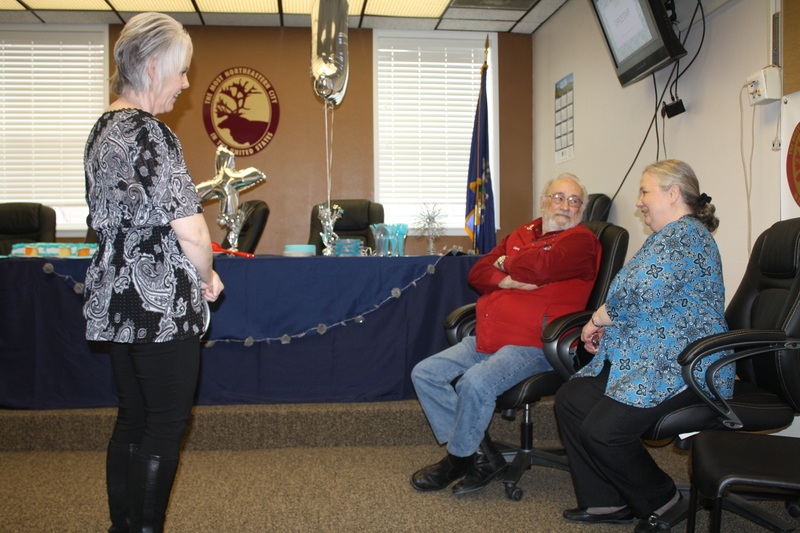 Colleagues and friends gathered at the City of Caribou council chambers on Monday, April 8, to bid a final farewell to Michaud. While enjoying treats of cake and popcorn, folks reminisced about Michaud’s friendly nature and commitment to serving the residents of Caribou. Before Michaud came to the city office, she held professional positions at many businesses, including the County Federal Credit Union and United States Fidelity and Guaranty Company. 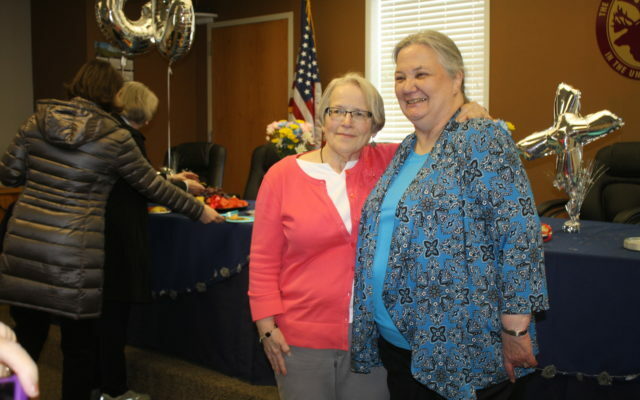 After she was laid off from her position at the USF&G Caribou office, Michaud initially applied for a job at Cary Medical Center but was offered her position at the city office shortly afterward. Michaud credits her co-workers with always being supportive and helping her pick up additional duties over the years, such as handling dog registrations and hunting and fishing licenses. One of Michaud’s longtime co-workers is Denise Lausier, executive assistant for the city manager. Lausier has worked with Michaud for 21 years and called her a “pleasant, friendly and courteous person” who has been “constant and steadfast” in her dedication, often staying in her office after hours to finish the day’s tasks. Now that her duties with the City of Caribou are officially complete, Michaud is most looking forward to researching her family’s genealogy, reading, bird watching, knitting and crocheting, and seeing what life has in store next.